Follow the fuel pipe back to the tank ,if no filter it will be a screen inside the fuel tank. Does anyone know exactly where to find the fuel shut off switch on a 2004 toyota tacoma 3.4L 6 cylinder? Where is the fuel filter for a Toyota Voxy 2001 model located? I'm not familiar with your vehicle but I'm surprised that a mechanic can't find the fuel filter! Usually the fuel filter is 'inline' .. a fuel hose clips on one side as the inlet and on the other as the outlet. Quite often the filter is greyish/silver in colour and may be about the size of a coke can. Get under your vehicle. Follow the fuel line from the fuel tank towards the engine. Chances are you'll see it underneath the car .. you're looking for a cylindrical metal container..
could be anything, you need to give a far more in depth description of the running of the engine. Does it run badly or is it smooth? does it rev and then drop? The air compressor is on that drive belt if you are getting a bad noise when the air is turned on you probaly need to replace the unit. You can try adding air compessor oil to the system and it may help. 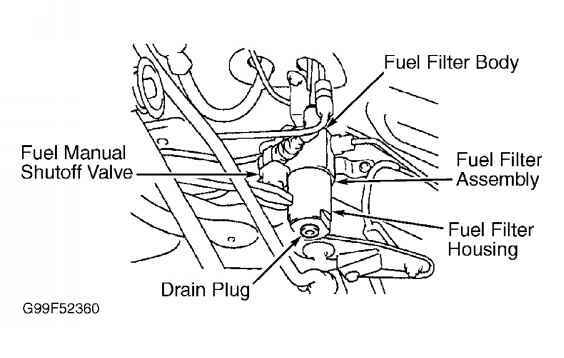 Where is my fuel filter in my 2001 toyota camry? 6 cylinder i want to replace my fuel filter and dont know where it is located. Toyota ipsum 2002 check light comes on with code P1346.